Now that the markets have bounced back and investor nerves are calmed, we can finally write about something less market / economic centric. Given the big market drop in Q4 and the big recovery in January, we wanted to emphasize the importance of staying invested and how going down the investment journey alone can be scary and impede your long-term success. In early evolutionary times, advice was passed from one generation to the next via DNA blueprint, giving some an advantage over others. At the dawn of the human age, we had a distinct advantage. We could pass on information to the next generations via additional channels. First by paintings, then by the spoken word, then writing. This enabled knowledge to accumulate, giving future generations a greater educational advantage, to avoid making the same mistakes and helping make better decisions. The vastness of the accumulated knowledge today is astounding, as is the ease of access. Just about anyone can learn just about anything thanks to communication advancements. This has led to the rise of the specialists. There is value in that focused knowledge as it can enable others to make better informed decisions without having to spend the time and resources becoming a subject expert. Doctors are the easy reference, as nobody is going to self diagnose… though WebMD does receive a lot of internet traffic. What about accountants? You can now do your taxes pretty easily using an off the shelf program. Is the accountant worth the extra expense? They could uncover a way to save substantially more on your tax return, or they could not. And there is the dilemma: often the benefits of advice are lumpy, sometimes helping immensely, sometimes not at all. Wealth management advice is not much different. There are periods when advice probably doesn’t add that much value and there are periods when it does. For instance in a long extended bull market, the advice premium for most is likely minimized. Just remaining invested in the market during a long uptrend is pretty easy to accomplish. But what happens when the market moves too high or suffers a prolonged correction like we saw in Q4? Advice that helps investors stick to their plan and avoid buying in to the peak of the next bitcoin like bubble, certainly is worth the expense. Think about investors that capitulated during Q4. By becoming too emotional and veering off course due to market volatility would have caused them to miss out on the January bounce. In 2017, when about every major market rose in value advice may not have seemed worth it. In 2018, with two major corrections, advice likely added value for most investors. Today, with CRM2 reporting, most investors receive an annual report that states their performance over the year and the fees they paid for advice. This transparency is critical but is only part of the picture. 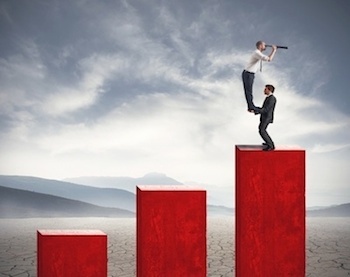 Performance is important but advice touches so many other aspects of wealth management. Far from exhaustive, below we have attempted to articulate various channels of advice when it comes to investing. Behavioural coaching – We all get emotional when it comes to investing and that can easily lead to mistakes. 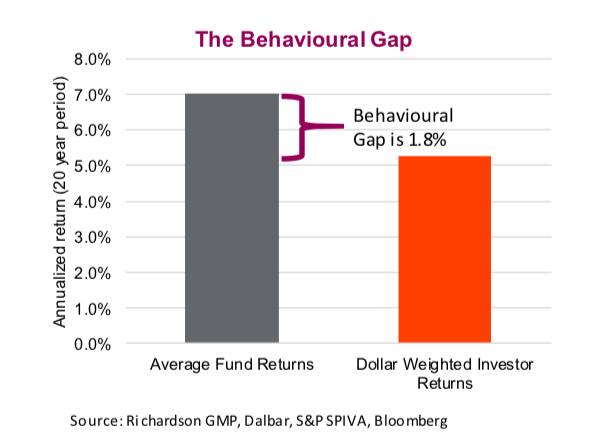 The chart below (‘Behavioural Gap’) is a quantitative measurement of the actual return the average investor experiences invested in U.S. mutual funds compared to the average return of the funds themselves. Over a 20- year period this ‘gap’ represented an annualized 1.8% and is mainly caused by chasing performance and capitulating. Essentially: buying the wrong funds at the wrong time or selling at the wrong time. Chasing performance is perhaps one of the most damaging behaviours when it comes to investing. Even with every disclaimer (including the ever-present ‘past performance is not indicative of future results’) we are all drawn to that great performing investment and want to partake in the gains. 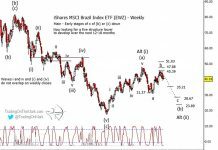 When it comes to funds, there is often a style factor that has led to a temporary outperformance. This may last years but based on history and experience, it often mean reverts. In other words, periods of outperformance are often followed by underperformance. And even the best performing managers have periods of underperformance. Selling them during these periods is often the wrong decision made by thinking too short term. 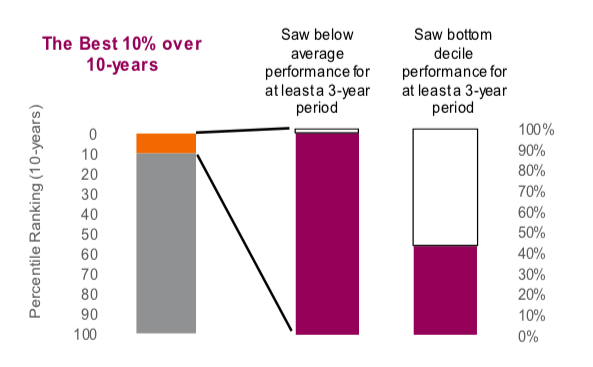 The next chart (‘The Best 10% over 10 years’) shows that even managers that were top decile over a 10-year period experienced sub-par results for a 3-year period during the same decade of outperformance. Amazingly, about half were also bottom decile for a 3-year period. If you sold these during this period of underperformance, you clearly were selling a winning manager. We are not suggesting investors ignore past performance, but instead urge them to better understand where it is coming from and why it may end. Most importantly, don’t get lured off your long-term allocations by performance, be it positive or negative. 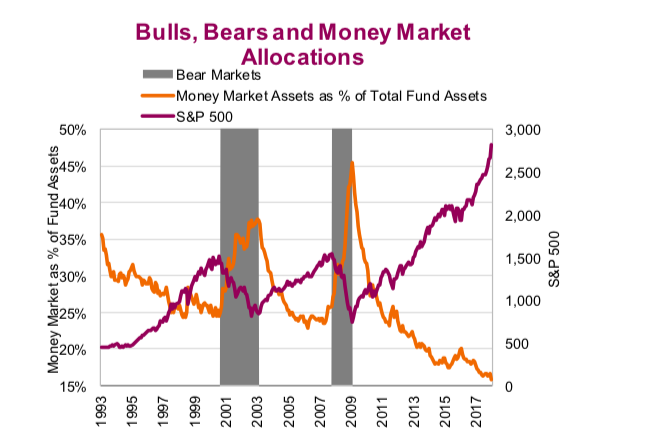 The chart (‘Bulls, Bears and Money Market Allocations’) shows the percentage of assets parked in money market funds over the past few decades. These peak near market bottoms and trough near market highs. That is literally buying high and selling low. While hard to quantify for each investor, behavioural coaching to manage emotions and avoid making rash decisions based on experience is clearly a value-added component of advice. Financial plan & asset allocation – Every investor has long-term goals, objectives, risk tolerances which should be incorporated into a plan to help drive a suitable asset allocation. While there are never any guarantees when investing, this can help create a strategy that has a high probability of meeting those objectives. Developing such a plan, measuring progress on a regular basis and adjusting to changing objectives over the years can go a long way in creating not just peace of mind but a longer-term mindset. This planned approach and way of thinking can help avoid being lured off course. Just missing a few months can have very negative long-term implications for your wealth. 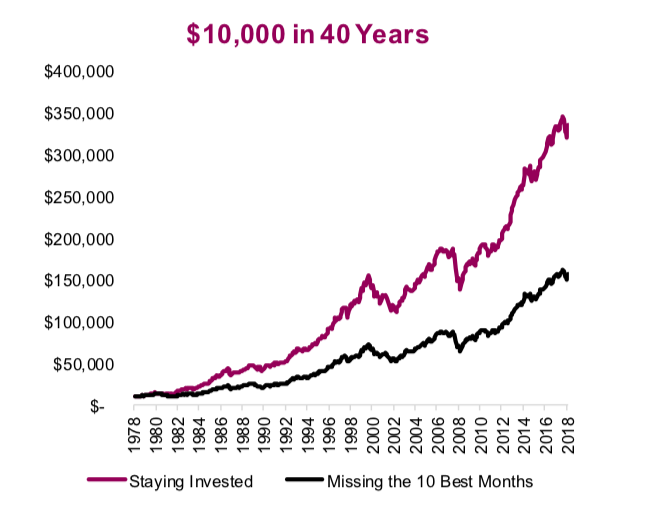 The chart (‘$10,000 in 40 Years’) is the wealth created via a buy and hold approach vs one that missed just 10 months. Clearly, we removed the best months but often those best months come following a painful periods. Just look at this past January, one of the strong months in a decade for many markets. Hopefully none of our readers capitulated in December. For the vast majority of portfolios, the biggest contributor to returns isn’t picking that hot stock or manager that is doing really well. It’s the asset allocation. As Harry Markowitz said, the only free lunch in finance is diversification. This is because returns from different assets classes are not perfectly correlated. 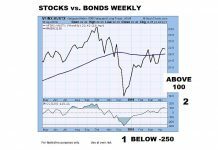 When a portfolio is constructed with a variety of asset classes, the risk adjusted return will be superior to that of a portfolio comprised of a single type of asset. Asset allocation is not just a math exercise. Advice can help tilt or become more tactical with your asset allocation based on what is happening in the market. 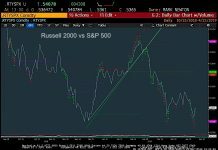 Adding more market exposure following a bear market or trimming market exposure when a bull cycle is getting on in years (hint: this bull market is about to turn 10). Not saying advice will always add value by being tactical, but the chances of success from a well-research approach is much better than sitting at home watching BNN. Advice can also help diffuse the familiarity bias that causes many investors to mainly focus on their domestic market. Plus, advice can uncover other investment strategies or access to other markets, to reduce this home country bias. The takeaway is that staying invested and having a strategic asset allocation are the biggest keys to long-term performance, not stock picking. Not coincidently, these are the two things most investors struggle with and attributes financial advisors and their advice can provide key support. Taxes & Fees – One shortcoming of the financial industry is the focus on pre-tax returns. Yet advice that helps improve after-tax returns can really make a big difference in your lifestyle in the years ahead. During the accumulation phase, using tax-sheltered accounts can grow your nest egg. Then during the de-accumulation phase, optimizing the source of cash flow withdrawals from a tax perspective makes a difference. On top of all this, there are estate tax strategies, wills, insurance, power of attorneys, etc. Clearly advice in these areas quickly becomes a net benefit as your financial situation become increasingly complex over your lifetime. Developing an investment strategy that is conscious of fees has become paramount and the good news is fees have been coming down among most investment vehicles. While we would not make an investment decision solely on fees, ignoring them is just as wrong. There is a balance as in some markets, notably those less efficient, active managers can add value or control risk better than the index. Most of us rely on advice because there are others that have greater knowledge and experience in certain subjects, and their advice can help us make better decisions. Wealth management is no different. It goes well beyond just picking an ETF, fund or stock.